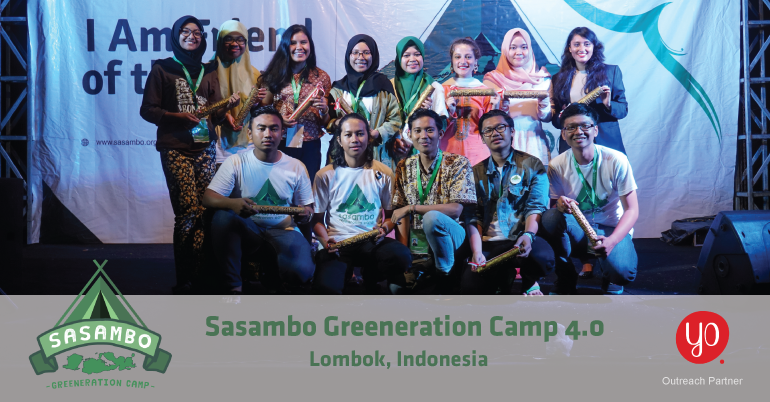 Applications are now open for the Sasambo Greeneration Camp 4.0 in Indonesia. There has been a growing interest in environmental issues within society. The rapid growth of population directly increases the demand for human basic needs while nature has its limit as some sources are not renewable. Moreover, high technological advances also have impacts on nature sustainability. The awareness towards this particular issue has been raised not only by government, but also academicians, experts, NGOs, and even the public in general. We believe that prompt action to preserve our environment should be taken by involving more social elements including the youth as the next generation. It is important for young people to be aware of this issue and involved in the endeavors to solve the problems. Sasambo Greeneration Camp is an event purposely organized for youth who are concerned about the future of their environment and have the intention to do a concrete effort to preserve nature. This event will also connect them as young leaders from around the world with a shared passion for environmental issues and similar projects to solve environmental problems in their own community. Therefore, through this event, the young leaders are expected to collaborate with each other and exchange ideas to create a greater change with an eye towards protecting nature and caring for our planet earth. Sasambo Greeneration Camp is an event purposely organized for youths who care about the future of their environment and have the intention to do a concrete effort to preserve nature. Sasambo Greeneration Camp will also connecting young leaders around the world with the same passion for environmental issues and similar projects to solve environmental problems in their community. Through Sasambo Greeneration Camp, the young leaders are expected to collaborate and exchange ideas in order to create a greater change to protect nature and be the great friend for our earth. Young Greeneration from around the world aged 15-25 years old. The selected participants that do a payment will be invited into the official WhatsApp group.